Could Ginger Be Better Than Chemotherapy? The medicinal components of ginger work primarily in the stomach and intestines. As an established folk remedy to treat motion sickness, nausea and osteoarthritis, daily consumption of ginger also does wonders for reducing the risk of high blood pressure and coronary heart disease. Ginger is known to beat drugs in defeating cancer and many inflammatory processes. The University of Maryland Medical Center cites several preliminary studies that suggest ginger may also lower cholesterol and prevent blood from clotting. Stopping your blood from clotting can help people with heart disease, where blood vessels become clogged and lead to heart attack or stroke. From Cancer Prevention to Weight Loss: 22 Benefits of Ginger Now, data published in Nutrition indicated that daily ginger consumption was associated with an 8% lower risk of developing hypertension and a 13% lower risk of coronary heart disease in adults. 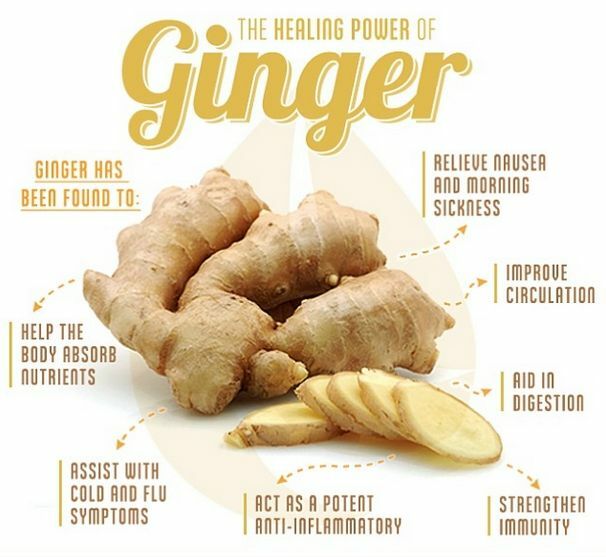 “The data indicated that ginger had a potential preventive property against some chronic diseases, especially hypertension and coronary heart disease as well as its ability to reduce the probability of illness by increasing 1g/d ginger intake on the basis of prior diet,” wrote the researchers. “It was a heart-healthy alternative to appropriately increase ginger consumption every day being recommended as a good dietary choice.” A study published in 2005 in the “Journal of Cardiovascular Pharmacology” found that ginger lowered blood pressure in controlled experimental conditions. Researchers investigated the cardiovascular effects of ginger on the blood pressure of different animals. Using crude extract of fresh ginger injected intravenously in rats, researchers found a dose-dependent fall in blood pressure. Further experiments in this research suggest that the blood-pressure-lowering effect of ginger is due to the blockage of voltage-dependent calcium channels. However, researchers did not examine the effects of ginger on the blood pressure of humans. Ginger The new study adds to an ever growing body of science supporting the potential health benefits of ginger. The rhizome of the ginger plant (Zingiber officinale) is a rich source of antioxidants, including gingerols, shogaols, zingerones and other ketone derivatives. It has been reported to possess anti-inï¬‚ammatory, antioxidant and anti-proliferative activities. Study Details: For the new study, the researchers assessed the effects of different ginger intakes (0-2g/d, 2g-4g/d, 4-6g/d) in 4,628 men and women aged over 18 for a range of chronic diseases, including anaemia, cerebrovascular disease, coronary heart disease, diabetes, fatty liver, hyperlipidemia, and hypertension. Results showed that there was only an association for ginger and the risk of hypertension and coronary heart disease in people over 18. Similar risk reductions were also observed when the researchers looked at over 40s only. However, the association with hypertension disappeared in people over 60. The researchers noted that the precise mechanism(s) by which ginger may reduce the risk of hypertension and other cardiovascular diseases are not yet well understood, but could be related to a potential inhibitory action on angiotensin-1-converting enzyme (ACE) and prevention of lipid peroxidation in the heart. They also note that the effects could linked to the polyphenol content of ginger. “On the basis of the present study, we provided a preliminary suggestion that daily intake of 2-4g/d ginger could prevent chronic diseases. However, larger different studies were necessary to be designed to confirm our findings and determine the optimum daily ginger intake for the prevention of chronic diseases,” they concluded.